MPC's Aluminum Back Panels are a popular choice to reinforce or support metal and plastic overlays due to their low density, rigidity and ability to resist corrosion. A lightweight yet strong metal, aluminum is easily machined and formed because it is softer than anodized aluminum. Aluminum back panels are not intended as show surfaces because they are most commonly produced using unfinished mill stock that may show surface scratches and other minor cosmetic imperfections. These imperfections are usually hidden by the overlay. Why Choose MPC's Aluminum Back Panels? Highly resistant to corrosion, oxidation, and extreme outdoor conditions, including extreme cold and heat. Expected exterior life of up to 10 years. Optional treatments can improve corrosion and abrasion resistance, such as application of a formulated paint, chemical conversion coating (Alodine), and clear or color anodizing. Attachment options include high-performance adhesives, stud insertion, stand-offs, holes and more. Precision fabrication in our machine and print shops to your design specifications in thicknesses ranging from .063" to .125". 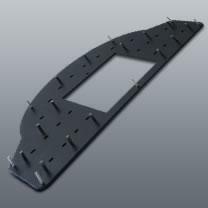 Aluminum Alloy 3003-H14 in standard thicknesses of .063", .100", and .125". Additional alloys and thicknesses available on request. Mill finish is standard. Optional finishes include: Clear and color anodizing, chemical conversion coating (alodine), and paint or powder coating. Advanced precision fabrication capabilities including milling, countersink and counterbore holes, bending/forming, stud insertion, stand-offs, permanent pressure-sensitive adhesives, and more. 15 working days from receipt of order and approval of artwork. Expedited shipment is available for an additional charge. Foil thicknesses require 20-25 working days.